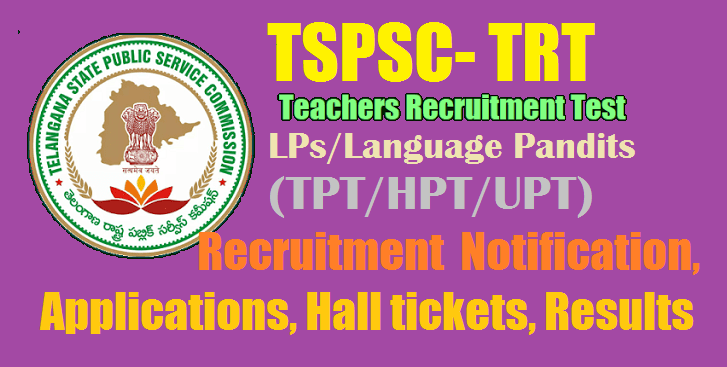 TSPSC TRT 2017 LPs/Language Pandits (TPT/HPT/UPT) Recruitment Test 2017 Notification, Applications, vacancies, eligibilities. TSPSC TRT 2017 LP/Language Pandits (TPT/HPT/UPT) Recruitment Test 2017 Notification, Applications, vacancies, Eligibility Criteria. TSPSC LP Language Pandits Teachers Recruitment Exam Results, Selection list Results, Certificates Verification Dates, TSPSC LP Language Pandits Teachers Recruitment Test Main Exam dates, TSPSC LP Language Pandits Teachers Recruitment Eligibility Criteria/ Post wise Qualifications, How to Apply-Apply online-User Guide for TSPSC LP Language Pandits Teachers Recruitment test, Exam pattern, Syllabus Structure and Content for TSPSC LP Language Pandits Teachers Recruitment Test, District wise and Category Posts Wise LP Language Pandits Teacher Posts Vacancies for TSPSC LP Language Pandits Teachers Recruitment test, TSPSC LP Language Pandits Teachers Posts Direct Recruitment(Scheme of Selection) Rules, 2017 and more details to be available on TSPSC Web portal. 1 Language Pandit(Telugu) i. Must possess Graduation with Telugu as one of the Optional / Graduation in Literature in Telugu / Bachelor's Degree in Oriental Language (BOL) in Telugu / Post Graduation Degree in Telugu from a University recognised by UGC with 50% (In case of SC / ST / BC / Differently abled candidates, the minimum marks shall be 45%) and Pass in Bachelor of Education (B.Ed.) course with Telugu as a Methodology subject or Language Pandit Training in Telugu from any institution recognised by NCTE.OR ii. Must possess 4-year B.A.B.Ed / B.Sc.B.Ed. Integrated degree with at least 50% marks (In case of SC / ST / BC / Differently abled candidates, the minimum marks shall be 45%) with Telugu as a Methodology from any institution recognised by NCTE. AND Pass in Paper II of Telangana State Teacher Eligibility Test (TSTET) / Andhra Pradesh Teacher Eligibility Test (APTET) / Central Teacher Eligibility Test (CTET) with i. Mathematics and Science or ii. Social Studies as Optional. 2 Language Pandit (Hindi) i. Must possess Graduation with Hindi as one of the Optional / Graduation in Literature in Hindi / Bachelor's Degree in (Oriental Language (BOL) in Hindi / Post Graduation Degree in Hindi from a University recognised by UGC with 50% (In case of SC/ ST / BC / Differently abled candidates, the minimum marks shall be 45%) and Pass in Bachelor of Education (B.Ed.) course with Hindi as a Methodology subject or Language Pandit Training in Hindi or Hindi Shikshan Parangat from any institution recognised by NCTE. OR ii. Must possess 4-year B.A.B.Ed. / B.Sc.B.Ed. Integrated degree with at least 50% marks (In case of SC / ST / BC / Differently abled candidates, the minimum marks shall be 45%) with Hindi as a Methodology from any institution recognised by NCTE. AND Pass in Paper II of Telangana State Teacher Eligibility Test (TSTET) / Andhra Pradesh Teacher Eligibility Test (APTET) / Central Teacher Eligibility Test (CTET) with i. Mathematics and Science or ii. Social Studies as Optional. 3 Language Pandit (Urdu) i. Must possess Graduation with Urdu as one of the Optional / Graduation in Literature in Urdu / Bachelor's Degree in oriental Language (BOL) in Urdu / Post Graduation Degree in Urdu from a University recognised by UGC with 50% (In case of SC / ST / BC / Differently abled candidates, the minimum marks shall be 45%) and Pass in Bachelor of Education (B.Ed.) Course with Urdu as a Methodology subject or Language Pandit Training in Urdu from any institution recognised by NCTE. ORii. Must possess 4-year B.A.B.Ed. / B.Sc.B.Ed. Integrated degree with at least 50% marks (In case of SC / ST / BC / Differently abled candidates, the minimum marks shall be 45%) with Urdu as a Methodology from any institution recognised by NCTE. AND Pass in Paper II of Telangana State Teacher Eligibility Test (TSTET) / Andhra Pradesh Teacher Eligibility Test (APTET) / Central Teacher Eligibility Test (CTET) with i. Mathematics and Science or ii. Social Studies as Optional. 4 Language Pandit(Marathi) i. Must possess Graduation with Marathi as one of the Optional / Graduation in Literature in Marathi / Bachelor's Degree in Oriental Language (BOL) in Marathi / Post Graduation Degree in Marathi from a University recognised by UGC with 50% (In case of SC / ST / BC / Differently abled candidates, the minimum marks shall be 45%) and Pass in Bachelor of Education (B.Ed.) course with Marathi as a Methodology subject or Language Pandit Training in Marathi from any institution recognised by NCTE.OR Must possess 4-year B.A.B.Ed. / B.Sc.B.Ed. Integrated degree with at least 50% marks (In case of SC / ST / BC / Differently abled candidates, the minimum marks shall be 45%) with Marathi as a Methodology from any institution recognised by NCTE. AND Pass in Paper II of Telangana State Teacher Eligibility Test (TSTET) / Andhra Pradesh Teacher Eligibility Test (APTET) / Central Teacher Eligibility Test (CTET) with i. Mathematics and Science or ii. Social Studies as Optional.